Click on drawing to see larger version. 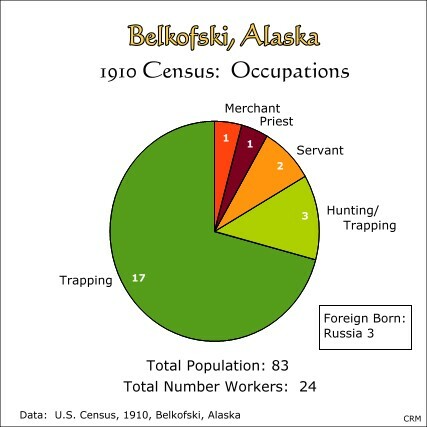 Belkofski in 1897 had a fairly large number of residents who were born elsewhere. This was due primarily to its importance as the center of sea otter hunting. 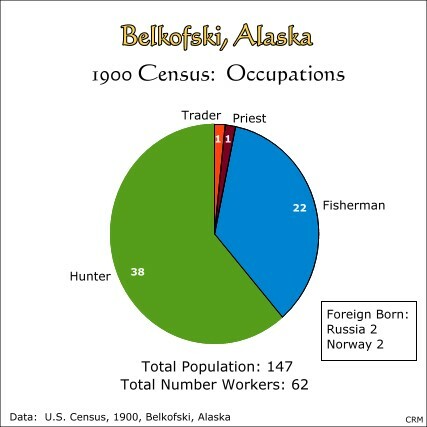 Belkofski was created by the Russians in 1824 when all the residents of Sanak Island were moved here, creating a new village.3 The Sanak area had always been the center of sea otter hunting and when the people on Sanak were required to relocate, they brought their skills and interests with them. Under the new American administration after 1867, it was logical that Belkofski would become an important sea otter harvesting center. 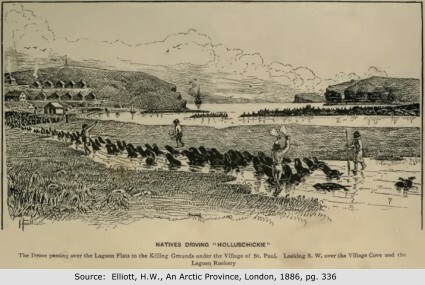 Sea otter hunters came from many other Aleut villages to take part in this lucrative hunt. There were high financial returns from the sea otter trade and the community prospered and grew quickly. The Belkofski population graph shows the impact of changing economic and social pressures. In 1834, under the Russian administration, the community was reported as having 102 inhabitants. The next population count in 1880, after the American adminstation took over, the population increased by almost three times. This large influx of people, as shown above, came as the result of the rapid increase in sea otter hunting. As practiced under the American adminstration, the harvest of sea otters was basically uncontrolled, highly exploitative and unsustainable. The result was the local extermination of sea otters in this area of Alaska. The consequences for the people of Belkofski were dramatic with two-thirds of the population leaving the community by 1910. The population history of Belkofski is closely intertwined with the other communities in the area. 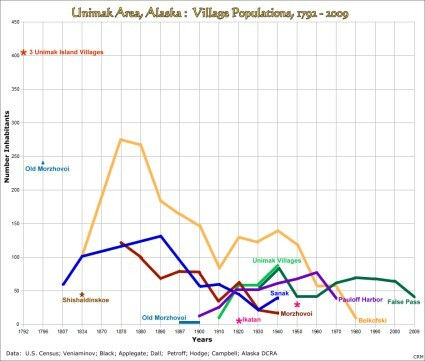 Detailed population data for Aleut villages during the early Russian occupation of the area is not available, but it is well known that there were massive relocations of Aleuts and consolidation of villages. In the Unimak area, these relocations resulted in increased size and stability of three villages, Morzhovoi, Sanak and later, Belkofski. 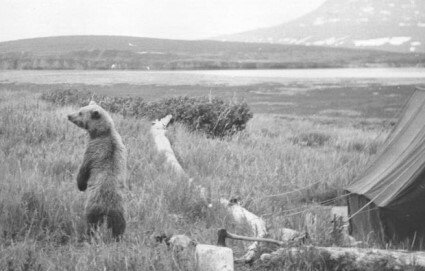 Under the Russian administration, all three villages were engaged in the hunting of sea otters, the trapping of land fur animals and the harvesting of walrus ivory for the Russian American Company.3 Because of the over-exploitation of sea otters around the Sanak Islands, the Russians moved the Sanak Aleuts to the Alaska Peninsula and created Belkofski in 1824. But, as soon as the Americans took over the administration of the area in 1867, Sanak village was re-settled and the Sanak islands and reefs and the islands near Belkofski became the center of the sea otter trade. 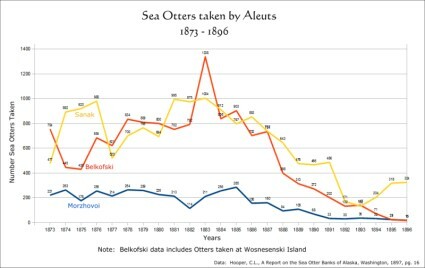 When the sea otters were over-exploited, the business collapsed by 1910 with strong negative impact on the population of all three Aleut communities as seen in the graph to the right. After the building of the King Cove salmon cannery in 1913, Belkofski became more dependent upon work associated with the salmon fishery. 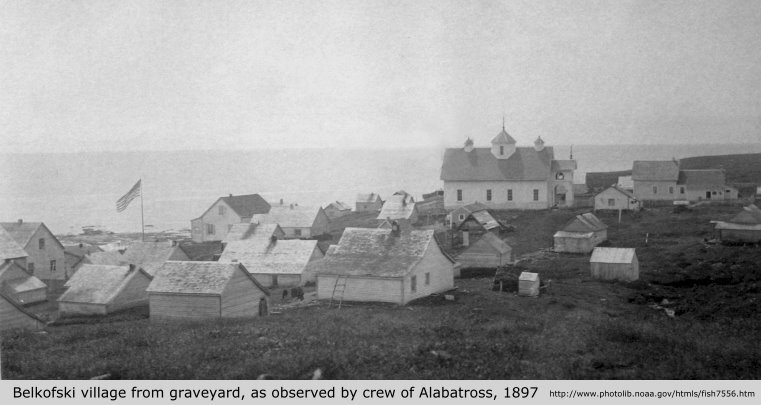 During Belkofski's waning years, many of the villagers emmigrated to King Cove and the village was completely abandoned about 1990. Click on graph to see larger version. 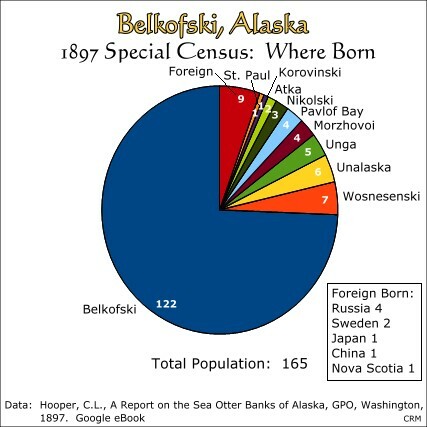 The 1900 census for Belkofski shows the heavy involvement of local men in the hunting of sea otters. It also shows that the sea otters were already being decimated and local people switched to work in the commercial fisheries. At this time, there were two cod fisheries in the area. The first was the codfish stations in Sanak and Shumagin Islands and local men may have found work there. 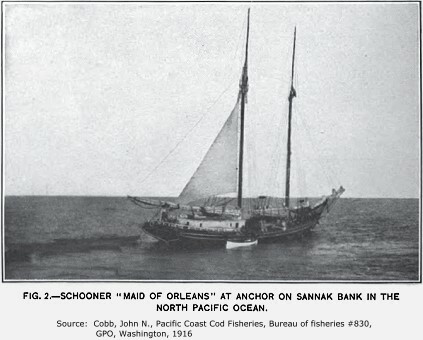 The second cod fishery was on schooners that fished in this area and in the Bering Sea. Another fishery was developing at the time. It was the salting of salmon and it occured at Thin Point, about 15 miles to the west. No details are available, however, about the involvement of Belkofski people in these occupations. The sea otter harvest graph below shows the rapid decline of the sea otter harvest in this area. 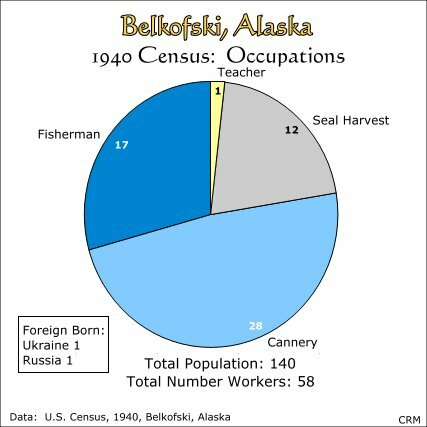 Belkofski at the 1920 census shows a major shift towards the commercial fisheries. The salmon cannery at King Cove attracted many workers and some of the Belkofski men became commercial fishermen themselves. Trapping was still important for some of the local men. See historical photo of King Cove Cannery here. 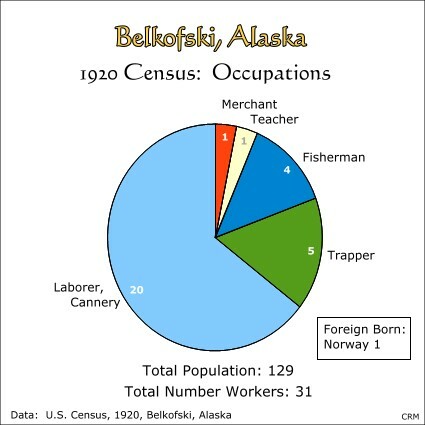 Belkofski at the 1930 census shows that a number of different occupations were now available. Traditional trapping of fur-bearing animals was still very important to the economy. Commercial salmon fishing and cannery work was also very important. The census shows more detail than in previous censuses and we see that there was one cod fisherman and one watchman at an island with sheep. Two men were employed at St. Paul, Pribilof Islands, helping with the seal harvest. 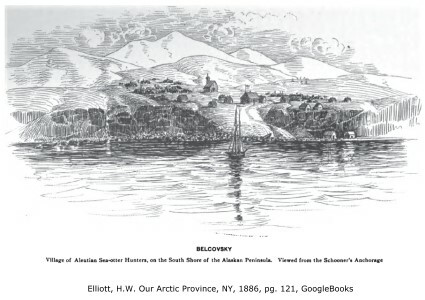 The seal drive is shown below in an 1886 sketch. 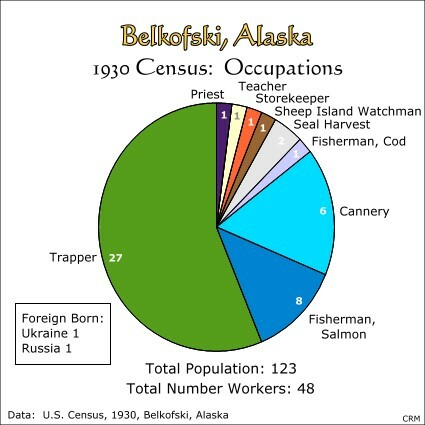 The 1940 U.S. census for Belkofski shows a shift away from trapping as the primary source of work. The fur market had collapsed in the late 1930's and did not recover. But, the salmon industry continued to prosper and since King Cove was nearby, many Belkofski workers spent the salmon season working at the Pacific American Fisheries salmon cannery there. During this time, many Belkofski men also worked as commercial salmon fishermen and delivered their catch to King Cove. It is interesting to note that twelve workers left Belkofski to travel to the Pribilof Islands to work in the harvest of fur seals. At this time the seal harvest was still relatively healthy and was controlled by the U.S. government. There is no occupation listed as Priest, but Father Hotovisky is still on the enumeration sheet listed as a fisherman. Belkofski did have a school with a single school teacher. 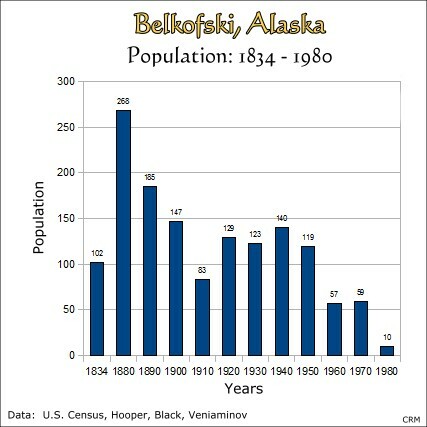 Detailed population data for Belkofski is not available after 1940. Little by little the population of Belkofski dwindled until it was finally abandoned about 1990. Many former Belkofski residents now reside in King Cove. 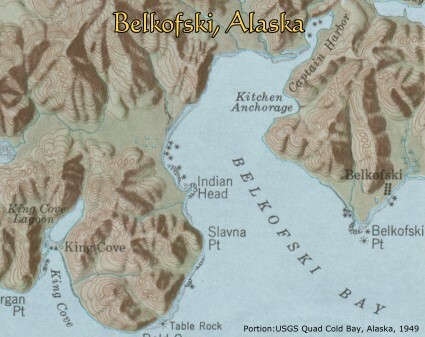 After the creation of the Alaska Native Claims Settlement Act in 1971, the Belkofski Corporation was formed and currently has its office in King Cove: Belkofski Corporation, P.O. Box 46, King Cove, AK 99612, phone 907-497-3122.